Two courses were used, the Championship course (6279 yards) and the Keir, (5879 yards). Our players started well and were ahead on the shorter course but shots were dropped on the closing holes. David Gillie and Colin Riddle went round in 69 and Paul McVie returned 73. On the Championship course, Darren Howie returned the second lowest score with 65. Simon Fairburn came home in 71 but had the bad luck of hitting the referee’s buggy and bouncing into deep rough which cost him a 7. Allen Turnbull could not buy a putt and returned 73. Other teams were not scoring much better with the exception of Ayrshire who were miles ahead. At the break we were well placed when we started the second round. The draw was alphabetical so we dropped down the list when our afternoon scores were added. Darren scores 67 to give a total of 132 which was the 4th best score, Simon had a level par 68 (total 139) in spite of 4 putting the last green. Allan’72 for a total of 149 after finishing on the Keir Course. Colin 2nd round of 73 for a total 142 and David 76, total 145. David did not have the advantage of a practice round. Paul was unfortunate to get into serious trouble on the 17th hole and run up a 9 for a total of 158. Five of the six scores count and when they were entered our score of 17 over put us in 11th place. Homeward bound was the song that flashed through my mind. But, as the later scores came in teams were dropping down the list. Bit by bit we went up the list and with our score in 8th place which is the final qualifying place. Lothians and the South were last on the Course, were they going to catch us? There later players were facing the harder course so we watched then hit the final green, miss their putts and watch the score board. We should not cheer a failure by another team, but we did. We were in the match play at last; we got to stay an extra day. 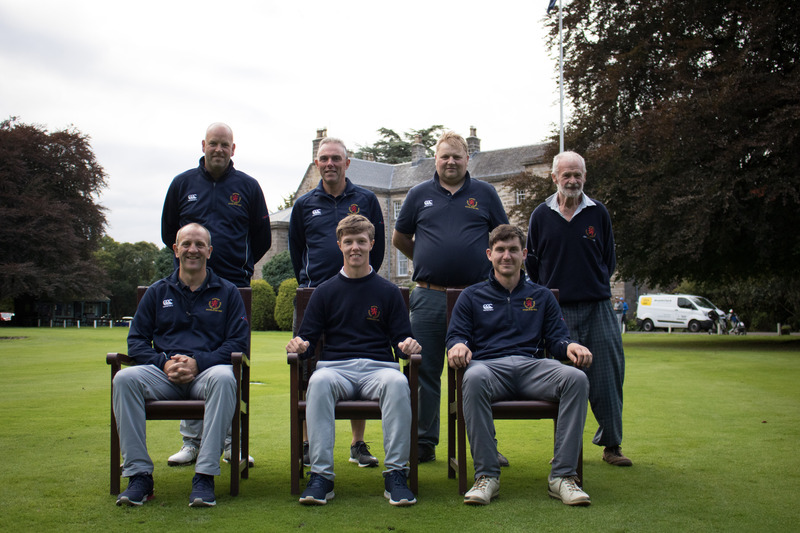 The format for the finals are one match of foursomes and four singles, as we were 8th seed, we, of course played the number 1 seed which was Ayrshire. First off, we arrive at the course to find out that one of our opponents was injured and had to withdraw from the foursomes. This meant a walk over and we were one up before a ball was hit. This was hard luck on the Ayr boys but it was also hard luck of our pairing or Allan and Paul. no match for them. Colin had chances but could not take them and lost 4and 3. Daren won his game and we were ahead. A win from one of the last two matches and we were through. David did not manage it and lost 4and 3. It was all down to Simon but it was not looking good. With 4 to play he was 3 down. I watched him on the 10th hole and his drive hit a tree and dropped into a bad lie, hole lost. Next hole, in trees, second shot hit tree, third shot hit tree, hole lost. I moved on, hoping things would be better if I was not there. It did not look good as we watched him play his second shot at the 15th hole. I looked as if the trees were in the way but he bent the ball around the trees, landed on the green and stopped about 10 feet from the hole. Holed the putt, 2 down 3 to play. The next, a par 3. The Ayr man was in the bunker and hole was won with a 3. 1 down 2 to play. Both players on the green in two, halved in 4’s. Last hole, 202 yards downhill. Simon’s turn to go in bunker, Ayr man, I will get his name shortly, (John Shanks) on green and rolls it up dead. Ayrshire 3 Borders 2. Disappointed but it was great to be through to the final stages.